Condition: Very good, no flaws. Teapot was not used, are safe, but rather a collection piece. I would say it again, if he had had almost 40 years old. Dimensions: 15 cm high, 20 cm width and 12.5 cm in diameter. Between 1972 and 1974 Stig Lindberg achieved for Gustavsberg - Sweden, limited edition "TERRA" - with a distinctive design and an unmistakable line, own famous designer. Each piece, handmade, is unique in its own way, because the collection minimalist design cleverly leaves develop color tones and different forms under glaze, even if the nuances are just blue and brown on a gray-blue, as you can see and teapot offered for sale. 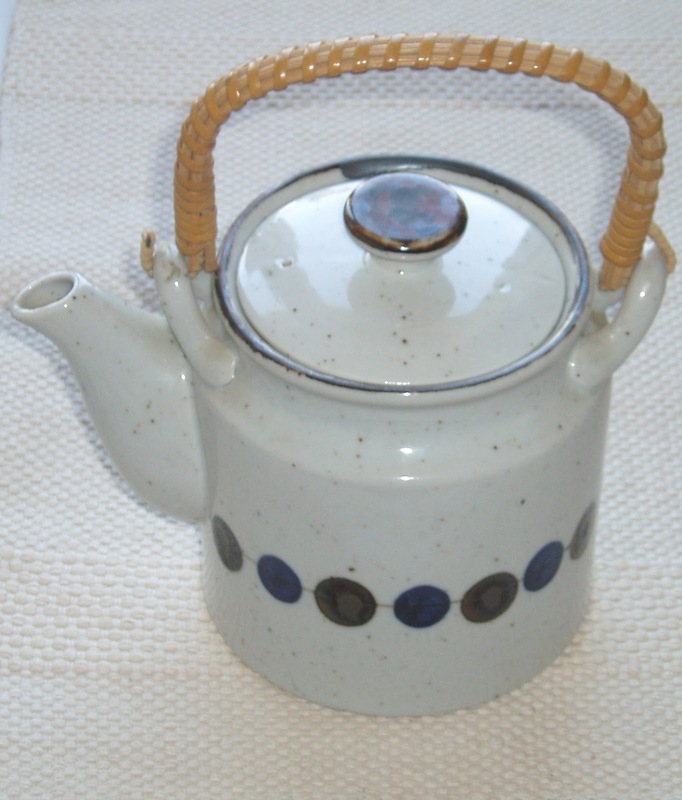 The colors perfectly match with each other and with rattan handle of the teapot. Hi, is not Gustavsberg, is not Stig Lindberg, is not Terra-series ! 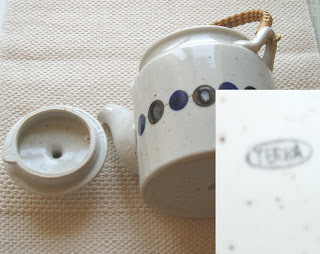 Is from far east, where they use Terra marks for export pottery, on cups and plates etc. Terra-series is always marked with Gustavsberg factory logo and StigL name and Terra-name, it is always handpainted (black and brown) on white bone-china. Thanks, for information! But I still think that is Stig Lindberg design. It is his style and shape! Is NOT Stig Lindberg design, all his designs are well documented in books and catalogs. I think it's a Takahashi Watsaburo teapot. Indeed it is a japan pottery. OK! It's possibile a Satsuma teapot, but who know?